The transportation portion of logistics is vital to effective operations. Rail is often a good option due to its low cost and high-volume capacity. The closer that transportation can be brought to the warehouse, the more efficient the operation is, but getting the rail close enough to the warehouse so that the need for an additional form of transportation is necessary can be extremely difficult. When the rail yard is not close enough to the warehouse, trucks are typically used to move the product from the rail yard to the warehouse. This additional leg of the product’s journey incurs additional costs. Rail siding places the freight train in an easily accessible proximity to the warehouse, eliminating the need for additional transportation. In rail terminology, a siding is a section of track that is separate from the main line or through route. Its distinction is that it is typically a low-speed section that takes it off the primary route. The rails are lighter, making it inappropriate for heavy traffic or high speeds. It is optimal for unloading and loading freight, and when it runs in close proximity to a warehouse, it provides an efficient, low-cost freight option. Many warehouses have evolved into distribution centers, and there is a lot more going on within their walls than simply storing goods and filling customer orders. Some of those activities are cost effective and others are not. Rail siding, though, is a value-added service that plays a very critical role in warehousing. It brings an important mode of transportation directly to the door, making it more accessible. What makes rail a better option than a truck? While it is true that trucks can go to more places and have fewer restrictions, trains can move considerable more freight. A rail boxcar has a much greater capacity for cargo— three and a half times that of a truck. While this may cause the price to appear higher at first glance, in the end the savings are significant. Rail can move more cargo but the fuel consumption is far less. Additionally, when moving cargo on one rail boxcar as opposed to three and a half trucks, it is much easier to track the shipments because you aren’t trying to keep up with multiple ones. There is often concern that the side-to-side motion of a rail car as well as the forward and reverse shifting that results from stopping and starting may damage cargo while it is en route to the warehouse. In truth, cargo shipped by truck undergoes the same types of motion. It is subjected to vibration, shifting, and shock—same as a rail boxcar. However, if the cargo is properly packaged for shipment, it arrives at its destination undamaged. Ensuring that the proper blocking and bracing, air bags, and dunnage are applied to protect your cargo and minimize or prevent damage that can occur due to the consistent shifting and movement of the cargo. Another reason that rail is crucial to the supply chain is because when the weather is bad the railroad is far less likely to be affected. When roads are closed due to storms, ice, or other weather-related hazards, railroads are typically still moving. They are also far less likely to experience accidents that tie up traffic and cause delays in shipment. While things can happen that can delay a rail car, that is far less likely than if the cargo was transported via truck. So rail siding only furthers the convenience and efficiency. 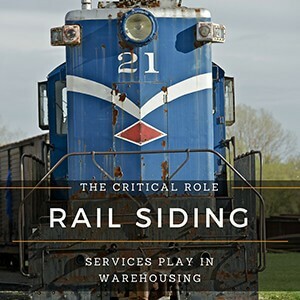 Rail siding plays a very critical role in warehousing, but not all warehouses are situated in such a way as to take advantage of the service. When looking for warehousing services, finding one that has rail siding services can save you a great deal of money in the long run.